Young man smiling while holding a microphone in front of him. Photo courtesy of Shutterstock. When you apply for a job after graduation, you may be asked to give a presentation in front of an interviewer or a panel as part of the screening process. This is often a requirement for sales, marketing, or other positions that call for face-to-face meetings with clients or management. Public speaking can be nerve-wracking, let alone presenting to decision makers who may or may not give you that sought-after break. The butterflies in your stomach are just one of the many physical indicators of tension – you’ll also sweat profusely, your body may shake, and in a worst-case scenario, you may experience mental block. Identify your key points. You can make down notes or cue cards that guide the flow of your presentation. You can take a look at them from time to time during the actual presentation. If you are giving a PowerPoint presentation, PowerPoint also allows you to make speaker’s notes that will appear on your laptop, but not on the screen the audience sees. Frame a story that appeals to the interviewer. Good tales are effective tools for catching and holding attention and interest, and creating favorable impressions. Prepare PowerPoint slides, images and other audio-visual elements that support your points or facts. Keep them simple so the interviewer or audience can concentrate on your message and skills. Rehearse in front of a mirror or with a live audience. This way, you learn to establish rapport, speak with the right intonation and tempo, and maximize body language. You won’t learn everything in one-time preparation. The process of achieving exceptional presentation skills is a long one. Before you become the next Steve Jobs or Chris Anderson, you need to take baby steps. While you are still in a university, you can take advantage of countless avenues to improve your verbal communication skills, structured thinking, and composure. You can start by answering questions or sharing your opinions in class. Facilitating club meetings or leading groups gives you additional opportunities to express your thoughts. You can also join the debating team, Toastmaster’ Club or any organization that willingly evaluates your ability to present ideas. You can also take baby steps with your friends or family. Leading a toast and being the emcee for your nephew’s birthday party are also good cornerstones. Make it a habit to watch presentation videos and learn from the techniques of different speakers. TED.com has a large number of free videos of successful entrepreneurs as well as ordinary people with moving stories. 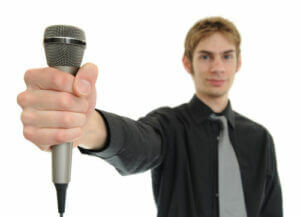 Notice how speakers convey ideas, establish rapport, move, and use slides. As you watch videos, you will realize that each person has his or her own unique presentation style. Take this as an inspiration to find yours. Toke Kruse is the CEO of Slideshop.com, a leading provider of pre-designed PowerPoint templates. Toke is a graduate of Copenhagen Business School and has launched nearly a dozen companies since entering the world of entrepreneurship at the age of 18.